Do you have the capabilities to carry out those bets? Where would you invest your time, money, and energy? We'll also explore some of those questions below. Visual foresight frameworks like this are supposed to communicate with your group where you are now and where you might go in the future. So, I will assume that you're using this in groups and not just through one-on-one engagements. It doesn't always have to be about innovation, either. This can still be a great framework to understand how you might sustain your organization into the future. There's an image I discovered which plots out 100+ potentially disruptive technologies across three horizons. Only a couple of technology classifications were used, but the amount of thoughtfulness put into it was impressive. I share more about that link at the very end of this article (Item 8). I hope this will spill some more light on how you can use the 3H framework in your work. The Three Horizons model was devised in 1999 by Merhdad Baghai, Stephen Coley, and David White in a book titled "The Alchemy of Growth." They wanted to show companies a framework for balancing both the competing demands between running current businesses and building new ones. You can see the original explanation on the McKinsey website here. The Three Horizons model endured for nearly two decades and has since then been readapted by practitioners and advisers throughout the years. For example, the Scottish consultancy International Futures Forum appears to have adapted the methods and made the 3H framework into their own¹. The horizon analogy relates to the time it takes to exploit an opportunity for a particular market according to your firm's particular know-how. While you can't erase uncertainty or achieve perfect knowledge about the markets and technologies, the point of the Three Horizons is to frame uncertainty across three simple delineations. Optimizing what you know versus discovering what you don't know takes vastly different skills sets and capabilities. You can protect your core business and preserve your main revenue-makers in Horizon 1, but how well can you sense opportunities at the frontiers in Horizon 2 and 3? Everyone needs to coordinate continual innovation projects across all three horizons. Projects can take many forms. For example, innovation projects don't have to be outcome creation initiatives like new products or services from the get-go. They can be persistent exploratory projects about how the future is shifting and changing. Core Business. Parameter Uncertainty. Activities that are most closely aligned to your current business. You have the assets, skills, and capabilities to optimize, defend, and protect what you already do well. You can optimize current business models and pursue existing markets. Market challenges here are well-defined; the interdisciplinary team of specialists in your business best suited to solve those challenges are clear. Competitors serve existing markets with mature technologies. Think n+1 and Red Ocean. This is where you'll find your existing processes, assets, traditional R&D, engineering, and acquisitions doing their thing. 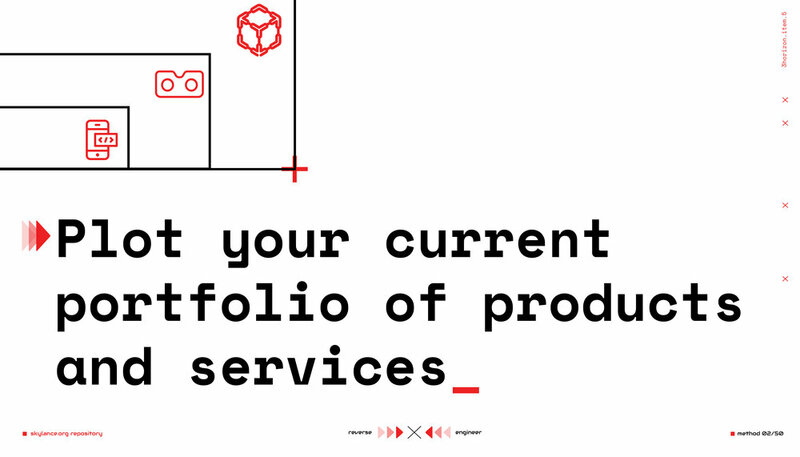 Most of your money is funneled towards maintaining your current array of products or services, or sustaining current innovations. Any competitive advantage is short-lived. Parameter uncertainties² are those which carry limited risks. For example, your product/service/app has a significant upgrade over the competition which is slated to be released in the next few months. You've got good reliable estimates on development, production, and marketing costs based on how you've always done it in the past; the only major uncertainty is the exact sales figure once the thing gets pushed out. What assets, skills, and capabilities will help optimize existing business models and technologies within existing markets? Adjacencies. Scenario Uncertainty. Taking what you already have, and extending it into new areas of revenue-driving activity. The market challenges are not well-defined. Specialists to work on these challenges are not well-defined, either. You have the assets, skills, and capabilities to adapt, pursue, and explore emerging or adjacent markets. You can accelerate and scale new business models or adapt existing ones. This involves your chess moves into new markets or developing new capabilities to enter Horizon 2. Think: Extensions, hence "adjacent" to your core business. They're riskier but may also yield higher rewards. You and your competitors may already be operating here to extend their reach, revenue, and technological reach. Next generation products and services might be more mature than the market is currently demanding. Defining new things here is high-risk but also high-reward. Enterprises endanger themselves to atrophy if they don't spend some resources expanding into adjacent markets. This is where multi-disciplinary teams, both inside and outside the organization, can make efforts to set up operations in this horizon. Sadly, many organizations may not have the time, skills, and necessary know-how to evaluate new technologies and determine their potential for new product and service development. Scenario uncertainties point to opportunities where the risks are big enough to merit a project cancellation, either during development or after the launch. In Innovation Tournaments, Terwiesch and Ulrich point to the example of a new diabetes drug entering phase 2 clinical trials. With a 65% probability that the compound will not reach the market, the new drug could end up a failure despite previous momentum. What assets, skills, and capabilities will help accelerate and scale new business models and technologies, or adapt existing business models to emerging markets? Moonshots. Unknown "Unknowns." This is the discovery and validation of new business models, technologies, and the shaping of future markets. These are long-term bets. The new categories of outcomes created here are new to the world, transformational, and visionary. Unknown "Unknowns" refer to those uncertainties where 1. you can't even articulate the variety of outcome scenarios or 2. even reduce uncertainty to a single parameter. However, this is the frontier of new discoveries and advances where new knowledge is applied to create new categories of products and services. Innovations here are literally the promised land of breakthroughs that organizations and businesses vie for, but that few ever reach. The challenges and the disciplines to collaborate are not well-defined. Years of multidisciplinary teamwork is needed to transform a specific industry. How do you even start? Teams need ruthless energy, tenacity, and perseverance when exploring the third horizon because of the massive time lag of 10+ years. Most exploratory clues into new technology development are buried in "basic research"³ and applied research. You're either sending adepts to scout and identify publicly funded research at universities, institutions, government labs, and conferences, or you have the resources to perform applied research yourself. What assets, skills, and capabilities will help you create new business models, discover new technologies, and shape future markets? The 70/20/10 rule ensured that our core business would always get the bulk of the resources and that the promising, up-and-coming areas would also get investment, it also ensured that the crazy ideas got some support too, and were protected from the inevitable budget cuts. And 10 percent isn't a lot of resources, which is fine, because overinvesting in a new concept is just as problematic as underinvesting, since it can make it much harder to admit failure later on. Million-dollar ideas are a lot harder to kill than thousand-dollar ones. "We spend 70 percent of our time on core search and ads. We spend 20 percent on adjacent businesses: Google News, Google Earth, and Google Local. And then 10 percent of our time should be on things that are truly new." 70/20/10 is just a rule of thumb. You can get away with ± 5% margins or thereabouts. Just don't think you must adhere to a strict ledger of numbers to come up with that exact ratio. Terweisch and Ulrich note that they're unaware of any methods or guidelines for "quantifying the optimal allocation across [horizons] for a given firm," but that mapping your current pursuits will highlight the most obvious problems. Lots of organizations may find they're heavily defending and protecting their core businesses and revenue-makers in Horizon 1. Meanwhile, that meager 2% or 1% could just be daydreaming and shooting in the dark; there's no real disciplined process to explore those areas. Don't be fooled into thinking traditional R&D and long term strategic roadmapping from Horizon 1 will automatically handle Horizon 2 and Horizon 3 efforts. Why? Horizon 1 is about sustaining the status quo; H2 and H3 are about taking risks in something that hasn't been previously done before, which is the crux of what innovation is. The inverse could also be true: Spending too much resources on the future horizons. Startups and small companies do not need to focus on all three. It's likely that you can't be that ambitious anyway in the beginning stages of your journey. But what you can do is be clear about where you operate. With a smaller team that possesses limited time and money, you're constrained to a few strong and concentrated bets. Each horizon requires more than just time, money, and energy, but also skills, disciplined processes, and approaches. Do you have the resources to organize, coordinate, and discipline your pursuits? Or do you need to temper radicalism just for now? Clearly define what Ulrich and Terweich call the Innovation Frontier. 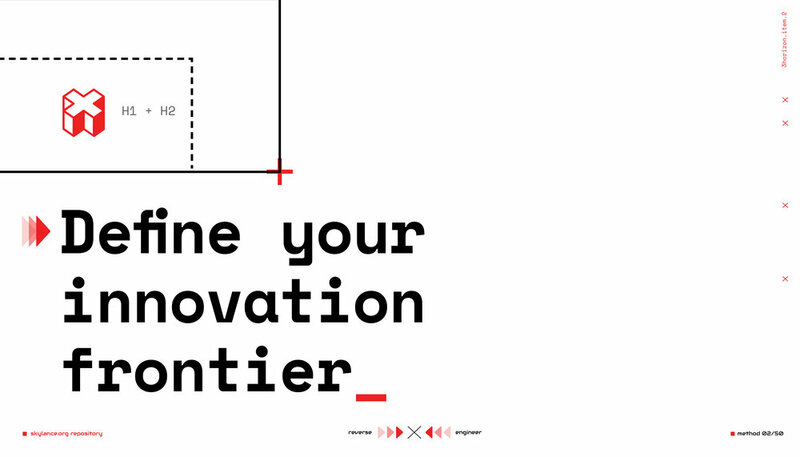 The innovation frontier is the boundary of the Three Horizons map in which you choose not to pursue opportunities. First, map your current roster of projects across the horizons. This snapshot shows where you stand right now and forces you to think carefully about what you can or cannot do yet with your current resources. Define your Innovation Frontier, but don't let it be an excuse to only defend your core business. 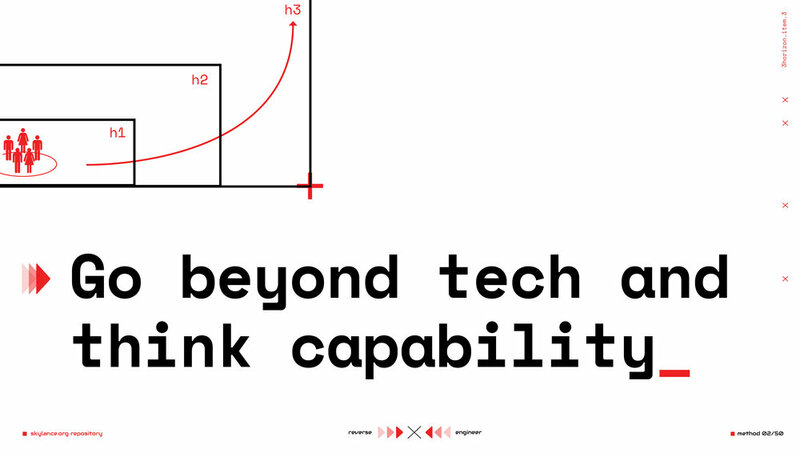 Let's swap "technology" with "capability." I define capability as "activities you can do continuously, with discipline and with competence." Technology by itself is not the innovation; it's novel, but neutral until it's applied to a tough problem in the market. What is blockchain or artificial intelligence by themselves? Start asking how those technologies can be applied to tough problems in specific industries, like finance or the aerospace industry, and you're off to a good start. If we agree that innovation is a constellation of ingredients, not a flash occurrence, then you need to make sense of your current capabilities that will ignite those ingredients together. Do we have an ecosystem of interdisciplinary teams? What skills and processes do we use to identify problems worth solving? Question 1 is all about diverse groups with deep expertise in a particular domain. In short, do you have the right people in place? They can come from outside or inside your organization. Questions 2 is all about cognitive diversity and how well those domains of experts (and newcomers) come together to solve tough problems. Each horizon may require different independent approaches, too. For example, you might be deploying Design Thinking as your organization's core capability with the mission to create new products and services. Be careful, though. Are you really out to create something really new? Or are you just defending the core? This might not be obvious in hindsight especially if you've already hired product design or service design specialists who are predestined to frame the outcome and for you. Too many companies just go through the motions of continuous improvements and non-stop iterations of their core business, using the latest flavor-of-the-month whether that be DT or Lean Six Sigma, without considering which horizons they need to penetrate. R&D departments assigned to pursue horizon 3 initiatives will expect high failure rates. That's why 10% is typically assigned here because not all prototypes or exploratory experiments will succeed. Alphabet Inc's Moonshot Factory, simply called "X" and led by Astro Teller, is a good example of a Skunkworks that relentlessly explores Horizon 2 and 3. Their ethos is that failure isn't always abysmal, but it's really "accelerated learning." Their current roster of far horizon projects (as of 2018) can be found here. Note that their projects are divided into three categories: In development, graduated, and discontinued. Another "capability" you can start developing is leveraging open innovation platforms, bounties, tournaments, and hackathons. Procter & Gamble has Connect+Develop; Facebook and Mozilla have their "bug bounties." Defense and military accelerators are great examples of those organizing tournaments to attract ideas from outside the government and military. The NATO Innovation Hub just successfully completed its second tournament in Paris, France (May 2018). How do you choose which horizon to consider a tournament? Terwiesch and Ulrich suggest that once you've mapped out your current pursuits, you can start talking about your current struggles and the missing opportunities that a tournament might fulfill. They also advise running independent innovation tournaments for each horizon. Defining the scope helps participants better focus their energies in generating the right types of opportunities. Mark Zuckerberg unveiled Facebook's 10-year roadmap during the F8 Conference back in 2016. No need to overthink this example, but it resembles the 3H framework, doesn't it? Horizon 1 is about nurturing the core Facebook ecosystem; Horizon 2 is about extending their core ecosystem and accelerating and growing their recent acquisitions; Horizon 3 is all about more ambitious initiatives towards implementing new technologies onto their core ecosystem. Keep in mind this was back in 2016. VR/AR, AI, and drone tech continues to advance, so you can imagine how much the third horizon is becoming more horizon 2 territory, albeit very slowly. You can try something similar where you're plotting your own portfolio across the three horizons. I would swap out ecosystems, products, and technologies with different categories proper for your context. The Business Model Canvas shows how you're creating, delivering, and capturing value. It can also be used to visualize where your time, money, and energy is really going when executing that business model. Before you can even start using the 3H Framework, I suggest mapping your business model as a starting point. Why? Lots of organizations don't have a clue on what their core business looks like. They know they "deliver" products and services, but are unaware of where the bulk of their resources really stand. Once you have that blueprint, you can really discuss what your core business looks like and what adjacencies and future long-term bets you can make. I created a video below to explore some visualization methods for the BMC. It was created primarily for nonprofits, but the same eight visualization tactics can carry over towards the for-profit side. You can't make a portfolio of bets if you don't even know what your starting points look like. I updated the nBMC as of May 2018. This is more a reminder than anything else. You're free to deploy conventional planning around Horizon 1. Test assumptions, establish a tracking system, and measure progress, but don't think you can totally eliminate uncertainty. Horizon 1 is all about what's stable, mature, and possibly fading away. Innovation on the other hand requires taking some measured risk to discover the unknown and to do something that hasn't been done before (rather than just optimizing and extending mature innovations). The 3H was not meant to be a static timeline. And besides, predictions crash and burn all the time. Rewind to the past five to ten years and tally up all the surprises you hadn't foreseen. That's why Google's 70/20/10 concept is a decent rule of thumb to adapt. You won't know which bets will really pay off as the years progress. You cannot foresee just how those two horizons will shift. Forget conventional metrics, conventional long-term roadmapping, and conventional analyses. All you can do is acquire the skills to make sense of how change might unfold and the opportunities within. A. Use the Gartner Hype Cycle for 2017 to scan for emerging technologies. (Gartner Hype Cycle for 2018 will be unveiled on August 28, 2018. Will update soon)⁴. B. SOFWERX's TechWatch is a regularly-updated primer which sentries over 25+ technology topics and trends relevant to military and defense innovators. As the fine print says, this is purely illustrative but with the intention of provoking people and institutions to be "future-ready." Get the full resolution printable version along with other thinking tools on Richard's site Now and Next. That wraps it up. I hope this sheds a little more light on how to use the Three Horizons framework in your workshops and engagements. I promised facilitation instructions, but this will come at a later date. I've attached a PDF of someone else's instructions⁵ in the footnotes below. I hope you can study it for the meantime. Got anything to add? Comment below. Liked this? Please share it if you think it'll help others. Want further ideas and tools to build on this? This 3H guide is an evergreen guide. Quickest and surest way to get tabs on updates is to sign up for free. Need my services? Contact me. The Scottish consultancy International Futures Forum appears to have adapted the methods and made the 3H framework into something more robust. Check it out. Innovation Tournaments goes through these uncertainty types in greater detail. There's a previous blog post I wrote explored a little bit about how "stealth" was "discovered" in Lockheed's ADP. Use the technologies, but as far as the Hype Cycle itself as a predictor, deploy some common sense as well. Note the criticisms highlighted here. Michael Mullany, General Partner at Icon Ventures, wrote an excellent post titled 8 Lessons from 20 Years of Hype Cycles which highlights some of the pros and cons of Gartner's Hype Cycles; take advantage of the comments there to understand both sides. The International Labour Organization has a strategic foresight toolkit with facilitation instructions. The format and interpretation of the 3H is different and looks largely based on the IFF approach, but I highly recommend studying it to see how you might divide your time up, pairings, partners, and a "trends deck" across the horizons. I will develop my own approach to this soon. If you're part of the mailing list, you'll get updates on that for sure.